My intel SSD failed. Hard. As in: its content got wiped. But before getting way too theatrical, let’s stick to the facts first. I upgraded my Lenovo ThinkPad X1 Carbon with a bigger SSD in the late summer this year — a 1TB intel 540s (M.2). The BIOS of ThinkPads (and probably other brands as well) offer to secure your drive with an ATA password. This feature is part of the ATA specification and was already implemented and used back in the old IDE times (remember the X-BOX 1?). With such an ATA password set, all read/write commands to the drive will be ignored until the drive gets unlocked. There’s some discussion about whether ATA passwords should or shouldn’t be used — personally I like the idea of $person not being able to just pull out my drive, modify its unencrypted boot record and put it back into my computer without me noticing. As people say, it’s good practice to frequently(TM) change passwords. So I did with my ATA password. And then it happened. My data was gone. All of it. I could still access the SSD with the newly set password but it only contained random data. Even the first couple of KB, which were supposed to contain the partition table as well as unencrypted boot code, magically seem to have been replaced with random data. Perfectly random data. So, what happened? Back to FDE of recent SSDs: They perform encryption on data written to the drive (decryption on reads, respectively) — no matter if you want it or not. Encrypted with a key stored on the device — with no easy way of reading it out (hence no backup). This is happening totally transparently; the computer the device is connected to doesn’t have to care about that at all. And the ATA password is used to encrypt the key the actual data on the drive is encrypted with. Password encrypts key encrypts data. Back to my case: No data, just garbage. Perfectly random garbage. First idea on what happened, as obvious as devastating: the data on the drive gets read and decrypted with a different key than it initially got written and encrypted with. If that’s indeed the case, my data is gone. This behaviour is actually advertised as a feature. intel calls it “Secure Erase“. No need to override your drive dozens of times like in the old days — therewith ensuring the data is irreversible vanished in the end. No, just wipe the key your data is encrypted with and done. And exactly this seems to have happened to me. I am done. Fortunately I made backups. Some time ago. Quite some time ago. Of a few directories. Very few. Swearing. Tears. I know, I know, I don’t deserve your sympathies (but I’d still appreciate!). Anger! Whose fault is it?! Who to blame?! Double-checking the BIOS if I unintentionally told my BIOS to change the FDE key. No, I wasn’t even able to find such a setting. Okay — intermediate result: either buggy BIOS telling my SSD to (re)generate the encryption key (and therewith “Secure Erase” everything on it) or buggy SSD controller, deciding to alter the key at will. Google! Nothing. Frightening reports about the disastrous “8MB”-bug on the earlier series 320 devices popped up. But nothing on series 540s. If nothing helps and/or there’s nobody to blame: go on Twitter! #ssd (@intel 540s) wiped after changing the ATA password in @lenovo #thinkpad BIOS. Either buggy BIOS or broken SSD controller. Be careful. @foobarblablub @intel @IntelSupport @lenovo thank you for contacting us Mirko. This is an issue that was fixed in the latest FW. Wait, what?! That’s a known issue? I didn’t find a damn thing in the whole internets! Tell me more! And to my surprise – they did. For a minute. Shortly before having respected tweets deleted. I guess I just became aware of being part of the “early customer validation”-program. This issue: Personally validated. Check. Sounds good! Maybe, just maybe, that could bring my data back. Let’s skip the second link, as it contains a dedicated Windows software I’d love to run, but my Windows installation just got wiped (and I’m not really keen of reinstalling and therewith overriding my precious maybe-still-not-yet-permamently-lost data). The first link points to an ISO file. Works for me! Until it crashes. Reproducibly. This ISO reproducibly crashes my Lenovo X1 Carbon 3rd generation. Booting from USB thumb-drive (officially supported it says), as well as from CD. Hm. Why there’s not I can’t find a damn thing about this bug in the media? 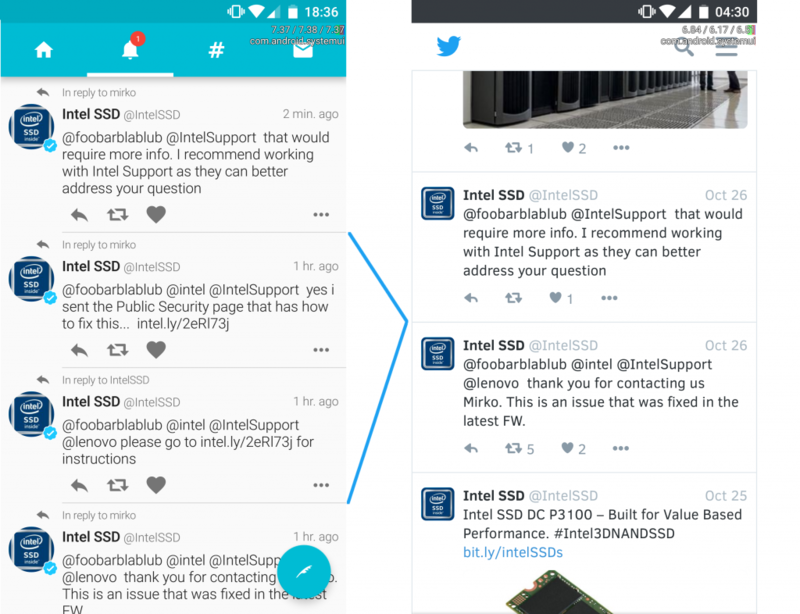 Why did intel delete its tweets referencing this bug? Why does the firmware-updater doesn’t do much despite crashing my computer? Why didn’t I do proper backups?! PS: Before I clicked the Publish button I again set up a few search queries. Found my tweets. I’m sure it’s a stupid question. But have you tried returning to the old Password? Setting the old Password again should generate a new key, but by some minimal Chance the could’ve implemented a more primitive method that generates the same key when the same Password is used. But that apparently just (re)encrypted the new/altered key.